Passers-by walk along East Third Avenue shortly after luminarias were lit. 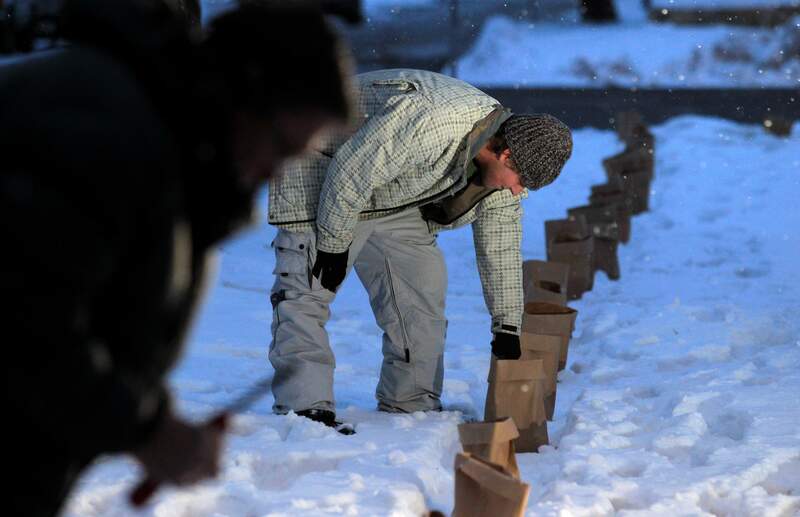 Volunteers assembled 1,200 luminarias, and kept the candles lit through the Christmas Eve snowfall. Jacob Sandy, right, and Fred Wildfang light luminarias along East Third Avenue Monday night. As dusk fell on Christmas Eve, it sometimes looked like a string of milky pearls  so long it must have belonged to an elegant giantess  had been strewn across the median of East Third Avenue, from the 200 block to Florida Road. But as darkness fell, and the shadows grew blacker, it seemed likelier that a procession of radiant, magic and enormous fireflies, subdued by the snow, had chosen to take shelter from the elements in a series of serendipitously placed brown paper bags. These illusions were the fruit of volunteers labor. From 3 p.m., they valiantly shuffled in the snow, bent over and pushing wheelbarrows, working to erect 1,200 luminarias  which are candles and sand ensconced within brown paper bags. 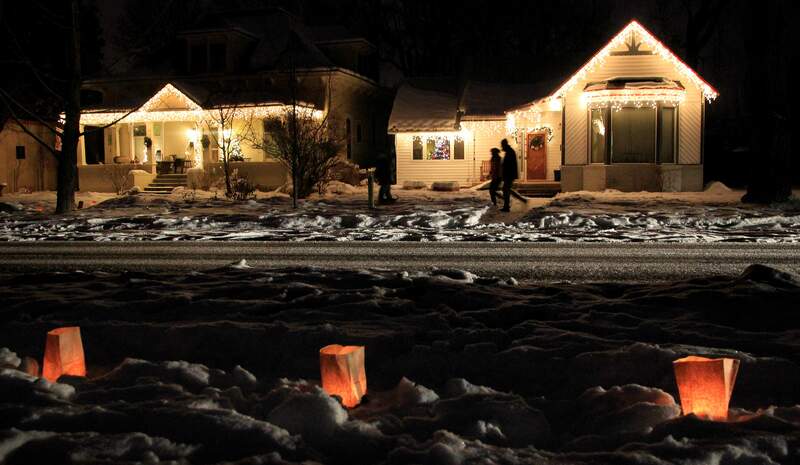 The luminaria display  a longstanding Durango tradition that was unofficially retired because a lot of work was divided among a few participants  was revived last year. This year, the effort was led by Graham Stahnke and Libby Culver of the Third Avenue Boulevard Neighborhood Association, and every block had a captain. As she placed candles inside brown bags, Kathy Gervais, a captain for the 1100 block, worried they werent lined up perfectly. My husband says the lines so crooked were going to get charged with a DUI, she said. Co-captains Ray Baranowski and former mayor Maxine Peterson of the 600 block said what was amazing was that people who didnt live on East Third Avenue were chipping in, despite the lure at home of warmth, eggnog, and family. Once you get enough people, it goes along nicely, Baranowski said. Though volunteers worried snow  which started to fall heavily after 4 p.m.  would snuff the candlelight, the flames proved resilient. The only mix-up occurred around 4 p.m., with a cluster of volunteers muttering about an unfolding crisis: There were no paper bags or candles for the 1200 block. Libby delivered them to every block captain. Ryan Phelps, at Hood Mortuary  hes the block captain for the 1200, but hes not answering his phone, we cant get a hold of him, Gervais said. But by 10 minutes after 4 p.m., the emergency was over. Phelps was pushing carts of unlighted luminarias out the door of the mortuary. Though some had supposed the worst, Phelps was assuring, and said that no one had died. In fact, he said, apologetically, hed been detained at church. In the end, the 1200 block was the first to be lit, and those who skipped church could take comfort by walking the Boulevard, which shone with the brilliance of votaries on the altar.